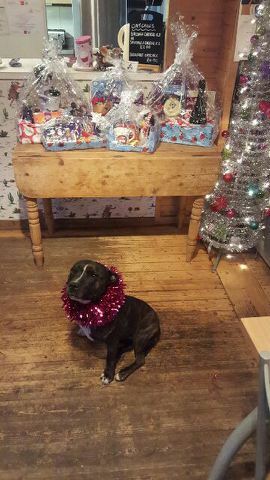 Hazel, the owner of the Nosebag Cafe & Pets Corner at Oak Lodge 43 Uttoxeter Road, Foston, Hatton, Derbyshire, DE65 5PX is kindly running another Christmas Raffle for us (she and her team are real stars and have been holding them regularly for us at Christmas and Easter times). The raffle tickets are now on sale. The draw will be held in the afternoon of the 22nd December. If you are near to the pets corner and cafe please do drop in, have a lovely cuppa and cake and please buy a raffle ticket. The hampers and prizes look fabulous. A big thank you to Doug too for his donation towards the prizes. The adorable and glamorous Roxy is once again pictured with the prizes. **** Thanks very much to everyone who brought a Christmas raffle ticket. You helped to raise £103 which go towards the care of the lovely cats and dogs currently with us. Best wishes to you all for Christmas and the New Year.